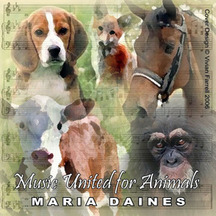 We are grateful to Maria Danes and her band who have very generously donated some of her CD's for us to sell to help our dogs. Maria is an animal lover who is very much involved in rescue work including being Patron of Dog Watch UK - The Staffy Campaign, and is involved with other rescue and campaign organisations including The Racing Dog Protection Act, and she is also co-founder of One Life Rescue, helping unwanted dogs in crisis and emergency situations. Please click here to read more about the wonderful work she does. The Maria Daines band is a hard rockin' 4 piece playing original material written by Maria & guitarist Paul Killington. They have played many events also to raise money for animal charities including supporting Pink at Cardiff International Arena for the Party For Animals World Wide in August 2007. 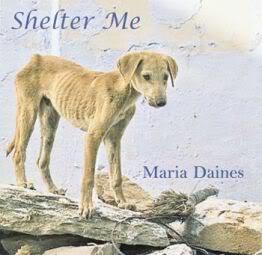 The cd's we have are 'Shelter Me' - A collection of songs for and about dogs, highlighting the need for compassion towards man's best friend and 'Music United for Animals'. These CD's are really good and would make a fantastic present for dog loving family and friends for christmas - or even just to treat yourself! If you are interested in one of the CD's they are £10 which includes p&p. Please "contact us" via email to rdr.fundraising@tesco.net with how many you would like to order of each CD, and your details. Payment can be made by paypal or cheque.